Shepherd’s pie was my all time ultimate favourite thing to eat growing up. More than mac and cheese, more than grilled cheese and even more than french fries, I would choose shepherd’s pie as my meal of choice. There was something about the combination of ground meat and mashed potatoes that was so, so good to me. Even now, a bowl of shepherd’s pie tastes like home, happiness and comfort. 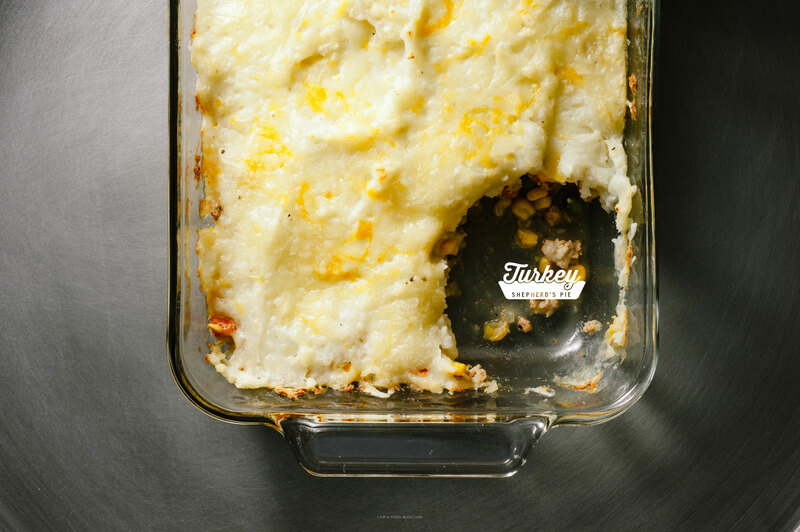 I first discovered shepherd’s pie at an outdoor festival when I was a kid. Sounds like a weird dish to have at an outdoor festival, but it was a Heritage Fair that was celebrating food and culture from around the world. The Irish tent was selling loads and loads of tins of all sorts of pies. My mom chose a pie for my brother and I to try, but being the penultimate picky eater, I wanted nothing to do with the unassuming tin of meat and potatoes. After five minutes of watching my mom and brother dig in with gusto, I ventured a taste and I was hooked. I asked my mom to buy me one to myself and proceeded to eat the whole tin without sharing. After that, whenever my mom asked me what I wanted to eat it was shepherd’s pie all day every day. She made up her own variations with whatever meat or vegetables she had on hand, but she always topped it with a thick creamy layer of mashed potatoes. 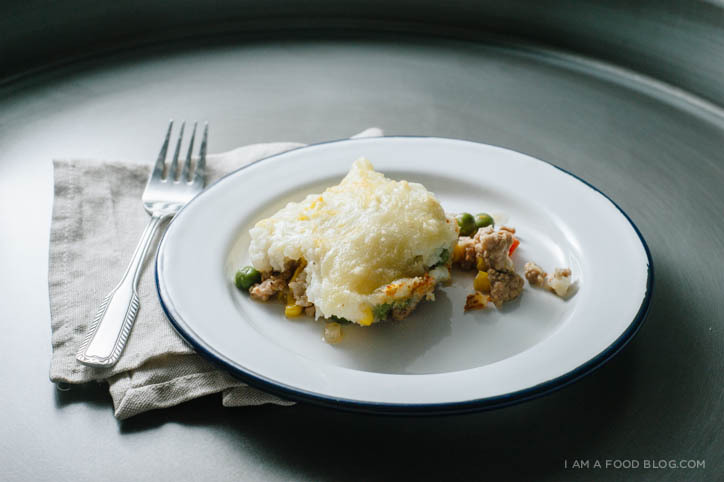 Shepherd’s pie is such a homey dish that it doesn’t even need a recipe, but I’ve given you a turkey dinner inspired one anyway. 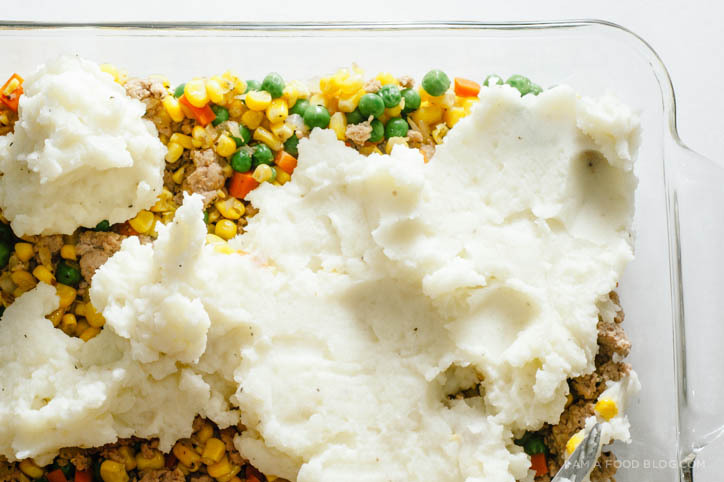 If you wanted to go all out, I think a shepherd’s pie layered with turkey, then cranberry sauce, stuffing and then mashed potatoes would be fantastic. I kept it simple here though, because sometimes, simple is best. Put the peeled and chopped potatoes in a pot and cover with water. Bring the water to a boil over high heat then turn down to a simmer. Boil the potatoes until fork-tender, about 15-20 minutes. While the potatoes are cooking, heat the oil over medium-high heat in a large frying or sauté pan. When the oil is hot, add the diced onions and brown slightly, 2 minutes or so. 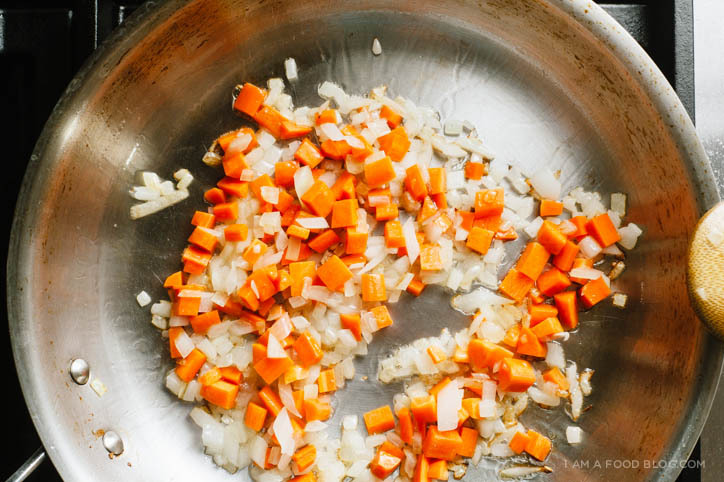 Add the carrots and cook until slightly tender, 2-3 minutes. Add the ground turkey and cook, breaking up the turkey into pieces. 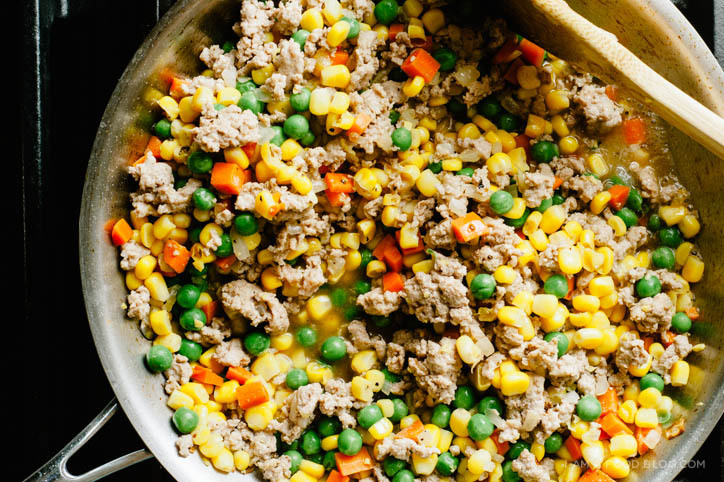 When cooked, add the frozen peas and corn. Mix well, taste and season with salt and pepper. Move to an oven-proof casserole dish. By now your potatoes should be tender. Drain and mash with 3 tablespoons of butter. Stir in the milk or chicken stock, taste and season with salt and pepper, adding more butter and liquid if needed. Top the meat mixture with the mashed potatoes and sprinkle with the shredded cheese. Bake until golden and delicious, about 30 minutes. You may want to broil the pie for the last 5 minutes if you really like a crispy, cheesy potato crust. Enjoy hot! 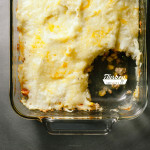 Sheperd’s pie has been on my to-make list for YEARS…and I have never had it or made it. I don’t know why, but I am loving this turkey version and I am smitten with the idea of a cran/stuffing one. Love your blog! Ah that looks amazing. You know how to make great comfort food. Nothing fancy about it… just what I would want after a long day of work. 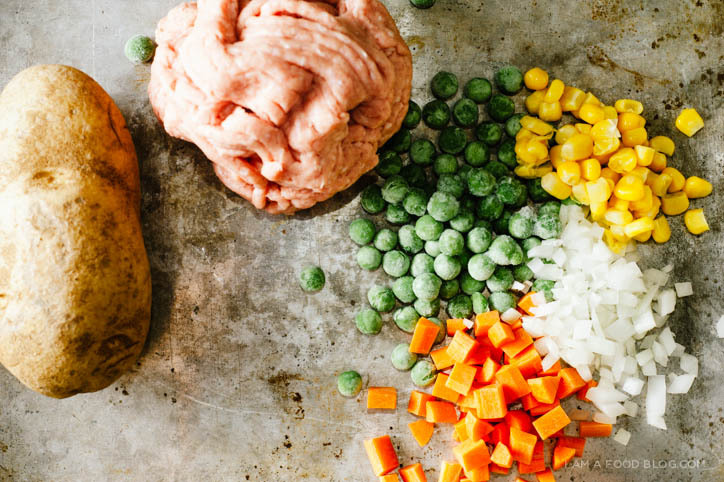 This shepherd’s pot pie is currently in the oven. I can’t wait to taste it until it comes out. I had to make a few adjustments, such as adding paprika and thyme. First ever Shepherd’s pie I ever made. how many servings will this approximately make? I’d say it would serve 4 comfortably. I used a 9×13″ dish but you can put it in a smaller one, if that’s what you have. It’ll just change the height of the pie, not affect the taste. Hope that helps! Just when I was getting ready to put the pie in the oven, a fuse blew. Apparently, the oven has a short. After a few more tries I left the oven alone, and I went on and put the meat on one of the burners to finish cooking it, and then serve the meat with the potatoes on the side. The pie will have to wait. I kicked this up a notch by adding pancetta, fresh Thyme, parsely and shallots and some heavy cream and turkey gravy added to the ground turkey base to keep it moist. I think the pan size does matter and wish this would have been suggested as cooking times would vary depending on how deep.. I rolled the dice with an 8×8 and it filled it perfectly. I made this pie and was so pleased with the way it came out that I’m making it today as a side dish for Thanksgiving Day. Simple to make, no fancy ingredients. And yes…it tasted good too. Tried this tonight and we love it! Thanks for sharing. Do you drain the can of corn? I have made this many times and it is always a favorite! It is the perfect easy recipe to make for my daughter. Thanks so much! This is an excellent recipe – nutritious, light, and delicious. My family loves it!